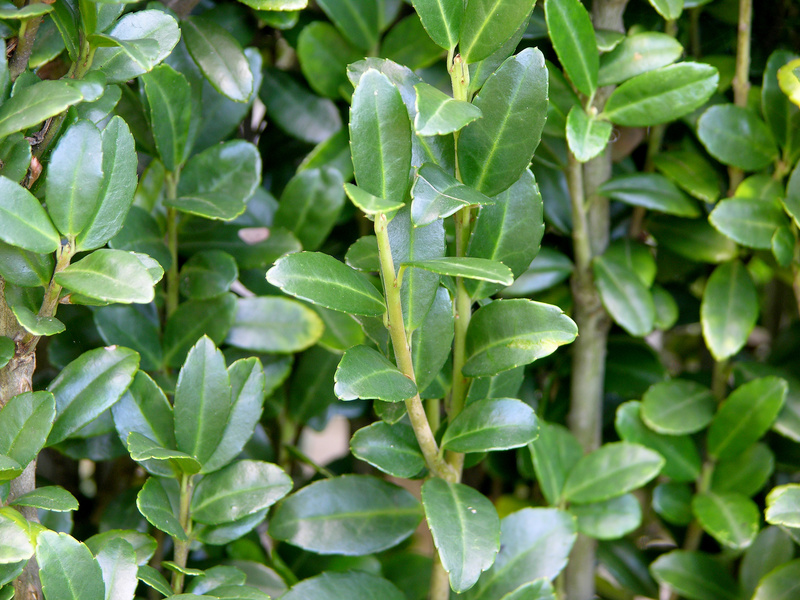 Shrub to 7 m tall (more commonly 1-2 m), evergreen shrub to small tree, densely branched, branches short, stiff, compact, new growth green, older bark gray. Leaves alternate, stalks short, blade stiff, about 2-3 cm long, crowded, shiny dark green above, lighter green below, elliptic or often widest above middle, tip rounded, base tapered, margin slightly toothed, blackish dots below, veins obscure. Flowers white, small, 4-parted, male and female flowers on separate plants (dioecious); May-June, visited by bees and other insects. Fruit fleshy, blackish, 0.6 cm, with 3-4 seeds, Sept. persisting into winter (Dirr 1990; Rehder 1986), eaten by birds. Habitat: Escaped from cultivation into forest understories, more often in overgrown horticultural sites, very shade tolerant (Greller, et al. 1991).